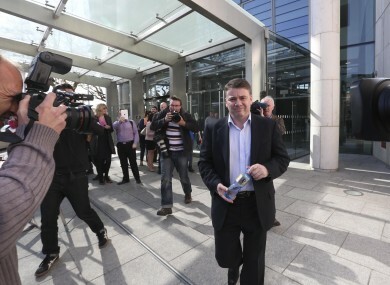 Pat Whelan leaves after sentencing. ANGLO EXECUTIVES PAT Whelan and Willie McAteer will be assessed for community service following their conviction for their roles in providing illegal loans totalling €450 million to 10 individuals. Judge Martin Nolan said that it would be ‘unjust’ to impose prison sentences on the Anglo pair because a State agency “led them into error and illegality”. The judge said that he could not be certain Whelan or McAteeer knew they were in breach of the law but were, nonetheless, in breach. He said that the crime was “not a victimless one” but repeatedly said that refereced how the Financial Regulator did not warn the men or see any problem with the proposed deal. In such circumstances, he ruled that it would be “incredibly unjust” to impose prison sentences on the men. They will be put on probation until 31 July when their suitability for community service will be assessed. The two men were facing a maximum of five years in prison and/or fines of €6,348 but Judge Martin Nolan told a sentencing hearing today that the fact that they were acting with the knowledge of the Financial Regulator and under legal advice counted in their favour. Whelan and McAteer, who were both senior figures in the bank when the deal was put together in July of 2008, were convicted under Section 60 of the Companies Act earlier this month for providing the illegal loans so that the ‘Maple 10′ developers could buy shares in Anglo. They were found not guilty of six other charges relating to loans provided to the Quinn Family. The court had earlier today heard from defence counsel who argued that the men’s actions were “demonstrably done as a matter of last resort” and were “not done in a dark room” but rather out in the open. Former Anglo CEO Seán Fitzpatrick, who was chairman at the time of the ‘Maple 10′ loan plan, was found not guilty of all the charges against him. The sentencing hearing was adjourned until 21 July to assess their suitability for community service. Email “No jail time for convicted Anglo pair, judge says prison sentences would be ‘incredibly unjust’”. Feedback on “No jail time for convicted Anglo pair, judge says prison sentences would be ‘incredibly unjust’”.